The original, bestselling blockbuster which has transformed businesses world wide. The blockbuster number one international bestselling phenomenon is back ... not that it ever really went away. This easily-read story quickly demonstrates three very practical management techniques: One Minute Goals, One Minute Praisings and One Minute Reprimands. The One Minute Manager also includes information on several studies in medicine and in the behavioural sciences, which help readers understand why these apparently simple methods work so well with so many people. The book is brief, the language is simple, and best of all ... it works. Ken Blanchard is the founder and Chairman of The Ken Blanchard Companies. 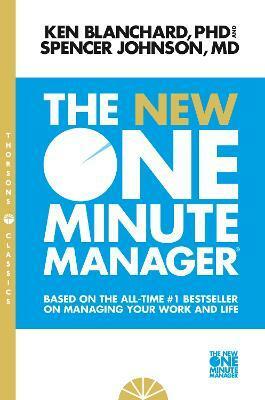 His One Minute Manager series has sold over 18 million copies and been translated into more than 25 languages. He has also written or co-authored numerous other books, including Gung Ho!, Big Bucks! and Raving Fans!. The Blanchards currently live in San Diego. Spencer Johnson is an internationally bestselling author whose books help millions of people discover simple truths they can use to have healthier lives with more success and less stress. His many bestsellers include The One Minute Manager (with Ken Blanchard), The One Minute Sales Person, Yes or No and Who Moved My Cheese?.